It was a picture-perfect Caribbean day this afternoon–deep blue sky, lagoon waters more blue than green for a change, and light just seemed to flow all around, even in the shade of a rom open to the sky. I had just finished tangling another tile, and was photographing it for upload to the Zentangle Mosaic app when I noticed the iPad was turning the picture blue. This had happened once before in recent weeks, and I hadn’t noticed the color until it was too late. This time, I did notice a very pale blue tint to the photo, and took the photo again. And again. And … We’ll, you get the picture. I tried moving outdoors–same blue. I moved to a different room–blue. And then I noticed all the shadows indoors and out had a definite blue tinge. An hour later, and long after I posted the tile, the blue was gone. Normally, I am pretty aware of light–it’s color, it’s texture, it’s luminosity, if you will. So I am not sure why I paid so little attention to changes in light color since moving to the island four years ago. Thankfully, today I did notice, and this will change how I perceive the island forever. Latitude, as one friend suggested? Reflection of ocean and sky? Just the right weather conditions? A mix of these and more? Something new to research and explore as I tangle away. 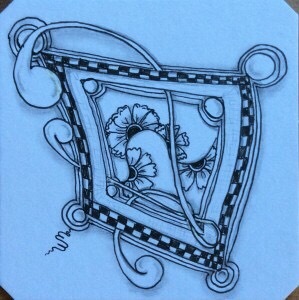 The tile here was part of a sort of challenge on the Zentangle Mosaic app by the founders of Zentangle. The idea is that we all run into stumbling blocks occasionally regarding what to tangle. The suggestion was to draw a frame that is far from the edges. Next step, aura it–outline it bigger on the outside. Next, draw a Mooka pattern–or a Zinger or other “long-stemmed” pattern starting at an interior corner and moving behind the frame so its “head” rests on top. Then embellish. Just a few simple steps to start the creative juices flowing. Before you know it, you have a completed tangle! When I draw challenges or challenge-like tangles, I like to keep things very simple. If I don’t, i keep adding elements until the pattern looks cluttered. Maybe that’s a reflection of what is going on internally, but I don’t always like the effect of dumping my clutter onto a tile. So I minimize. The benefits of meditation are still there, as I still need to focus and concentrate to keep lines straight and relatively even distances. But I stop long before I might if tangling completely from my own mind with no suggestions from outside. We each have our own style of tangling, especially under unique situations. This is my “challenge style.” And sometimes it turns blue.